The essence of Kendo consists in Kiri-otoshi, or 'striking downwards' and each technique is virtually the same. If we can master a single technique of delivery this may be applied with equal facility in any direction or angle. For clarity we are forced to separate various actions into sections but the student is advised to regard all techniques as simple variations of the basic fundamental action. Two directions of cut are included, with the blade moving forward Oshigiri, or backward, Hiki-giri. The angle of stroke is either straight vertical, or diagonal lateral. For simplification all diagonals are expressed as forty-five degrees. With two directions and two angles it is therefore possible to strike any portion of the opponent's body by adjusting the direction or distance in which our body moves. The diagonal stroke is just the same as the vertical except that the arc of the stroke is canted over to either side. Fluidity of technique comes with the understanding of the basic principles involved in the movement of the body and the swinging of the Shinai (bamboo sword). As mentioned earlier the great principle of Nature operates on circular or cyclic action and this holds true not only with the physical plane but also abstracts and conditions. In macro-cosmic proportion the planets turn and in micro-cosmic proportion the pattern repeats in the wave flow or vibration of matter. This is also reflected in the 'Turning' of the seasons and the transmigratory nature of all existing forms and things. With an axis which revolves the simple circles appear as a spiral and should the spiral also be spiralling the resulting motion is too complex to understand. In actual fact the common factor in all motion is that it shall be relative to itself rather than to the surrounding space. By this means we return to the fundamental circle as a basis both for our actions and viewpoint and our particular school is known as Kyu-shin-do or 'heart of the circle'. The human body is a perfect circular machine, designed to turn on pivots and capable of extremely harmonious and smooth movements if properly directed. To make ugly, stiff actions or to force our limbs into a straight line by our human conceptions of speed and directness is as though we took up a finely made pair of compasses and proceeded to draw straight lines by constantly altering the radius. A circle viewed from the side is a straight line and a straight line can be followed by a gradual unwinding of the joints and the basic attitude of mind is to let the circles play themselves out and not keep our attention on the straight line as such. In Kendo even the thrust is regarded and understood as merely a different direction of circle, or cut. The first principle of the stroke is that a perfect circle is made, as in diagram 7. The two forces of centrifugal force (Enshin-ryoku) and centripetal force (Kyushin-ryoku) play a great part in our handling and control of the Shinai. It will be noted that if the Shinai revolves an inch or so from the hilt end the motion/force/speed ratio increases to approximately x24 at the tip. It is therefore a great advantage to turn from one end and strike with the other. The Shinai is divided into three sections on the blade the Dage-kibu (striking base) above the leather Musubi, or thong, the Chu O (centre section) and the Tsuba-moto (guard base). As a general rule blows are struck with the Dage-kibu and the opponent's blade controlled or taken off along the Tsuba-moto which not only moves more slowly but also gives greater control of the point. The only problem is that the effort required to turn the Shinai will be inversely proportional as we leave the periphery of motion and the way this is overcome is by the second principle. Diagram 8a shows an arm turning in a an antic-clockwise direction about a fixed point (a), another extension arm being pivoted at point (b) and allowed to swing freely. As the inner arm revolves to position 8b centrifugal force will act outwards from the centre and the extension arm will open with increasing velocity. 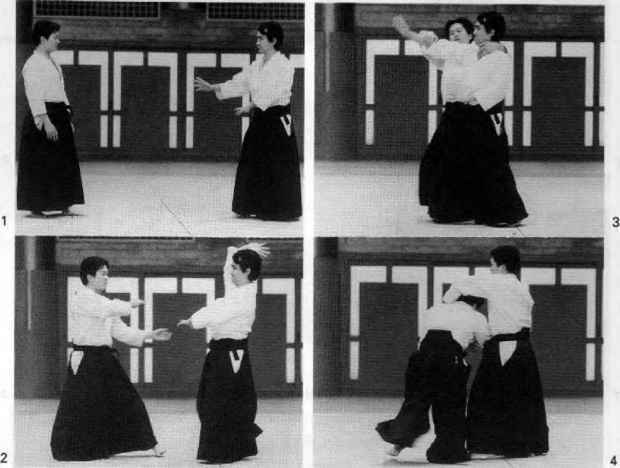 Diagram 8c shows the way in which this applies to the cutting arm in Kendo. In this case the inner section from shoulder to elbow may turn forty-five degrees. The second section, from elbow to wrist may turn through twenty two and a half degrees, whilst the Shinai itself may turn only eleven degrees or so. In each extension the actual distance and motion is less but the speed increases. A very common fault of people not understanding this principle or who cannot be bothered to study it during their practice, is to attempt a levering type action with the right hand and pivot the Shinai from the left hand. Whilst the ratio of correct stroke is 24 to 1 the latter ratio will only be about 3 to 1 so whilst, the levering section appears easy through ignorance it is in fact making very hard work of the cut. It is better to start correctly from the very beginning and loosen the shoulders well. The outward feeling and spaciousness of technique is also essential in developing the Kokyu or 'breath power' essential to Budo. Having understood the first two principles we must now examine the final result in the moment of cutting, called Ki-ken-tai-ichi, or the moment when 'spirit-sword-body' become 'one'. At the moment of impact there must be focus of all available forces to one point and this is best developed in three explanatory diagrams. 9a shows the angle of approach as the Shinai strikes. In this basic action the only available force is that implied by the radial velocity, which will fall at a tangent to the arc and results in a 'penetration angle' of about ninety degrees. This is not good since it is as though we cut a loaf of bread by pressing straight downwards. The centrifugal force being countered by centripetal force. 9b shows the same condition but in this case the Shinai is metaphorically flung forward on impact and in the crucial instant this has the effect of countering the centripetal effect. The result is the introduction of centrifugal force, along the length of Shinai. The result will be a new penetration angle bisecting the two forces at an angle of forty-five degrees, and an efficient 'slicing' action is implied. 9c shows the force line of the body moving forward and the final angle is again bisected to arrive at a very efficient slicing angle of penetration. In this way the downward cutting action of the stroke is directed forward and the penetration action is implied rather than factual. 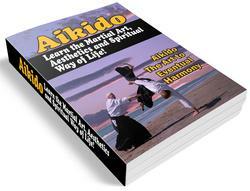 The Kiai or shout is uttered at his moment and serves to throw the mind and spirit into the Shinai. 10 shows merely the final effect in reverse, when a cut is made with a backward step. In this case the arms are straightened but the Shinai is drawn back in imagination and the whole direction reverses inside the arc of the stroke. The stroke is very rapid and normally made during the first few years with a wide and full swing to loosen the joints and to develop a free and easy style. When we cut we either stop the action dead, at head level if exercising alone, or strike to just below the surface of an imaginary target area. The effect of merely chopping downwards makes the action difficult to control, especially if the student attempts to directly oppose the arc of the stroke. By flinging forward at the final moment the Shinai is easy to halt and the right arm acts rather as the tall-chain on a lorry since the major downward force has been redirected forward. A well controlled blow lands sharply and cleanly, with a crisp snap, and follows through smoothly and easily.